A glimpse at my life recently in photos. A visit to the doctor usually isn't so bad if I include a stop at Ladurée. I opted for the Les Incroyables box this time around. Aren't the silver clovers charming? Chocolate Santo Domingo and Rose Bubblegum were the new flavors we tried. The Chocolate Santo Domingo is divine especially if you enjoy dark chocolate. I wasn't as crazy about the marshmallow filling or sweetness of the Bubblegum. The pretty orchids that we've been enjoying on our dining table thanks to hubby's green thumb and TLC. 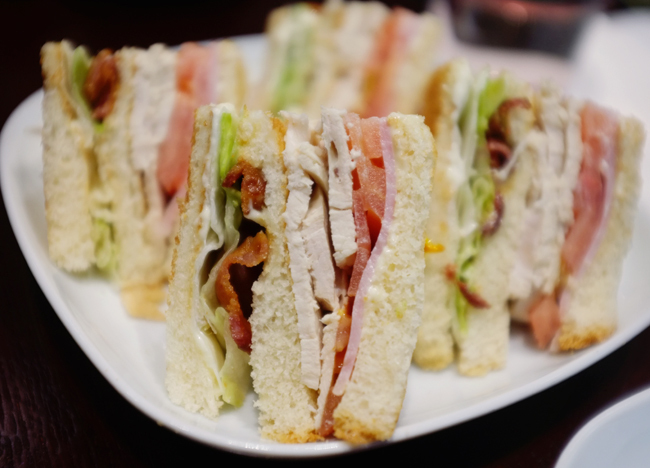 My favorite club sandwich in NYC is from Mini Express in the Chinatown Arcade. Yes it is a Chinese restaurant and their club sandwich rocks. 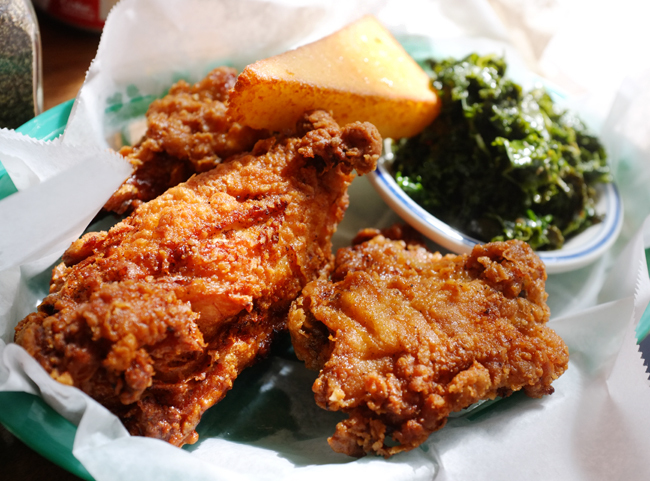 Buttermilk dipped fried chicken with a side of garlic kale at Dirty Bird in Tribeca - good stuff! 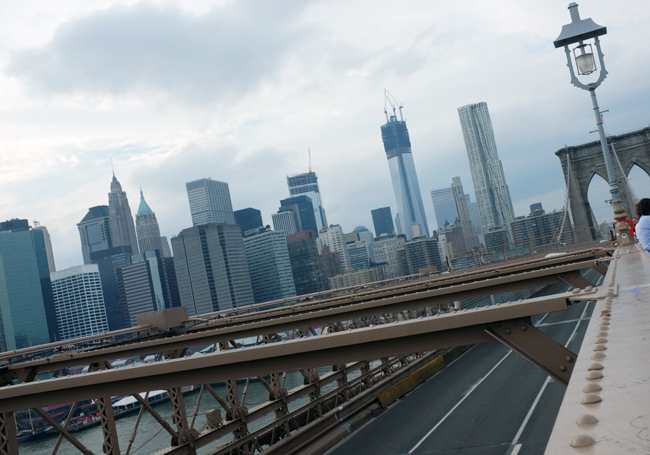 One of my favorite city walks is across the Brooklyn Bridge. This is the almost mid-bridge view looking towards lower Manhattan. 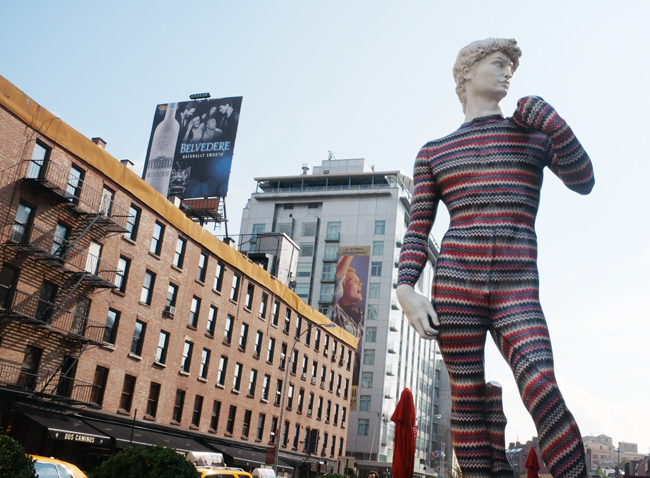 and designer Luca Missoni standing tall in the Meatpacking district. This Nora Kogan Loved Ring has been on my wishlist for awhile and it's now mine. Two small diamonds are set into the other side of the band. A new fall outfit for Ian purchased at Target. It looks so good on him! Photo to come. New kicks for hubby and me. We like comfy shoes on the weekends. I love the pictures! Amazing!!!! Such a lovely glimpse into your month, Wow, you have a Laduree near you, sooo lucky! The orchid is as beautiful as the artful way its been photographed. Myword, now thats a style statue! Ian's new outfit looks ultra chic! Cute pink shoes. i WANT the laduree macarons, omg'd that club sandwich, and buttermilk dipped fried chicken!!! hahaha rowena that food looks so delicious :) i'm having a serious yummy heart attack right now. hahaha your new pink shoes and ring are adorable! enjoy them! i can't wait to see ian in his new outfit for fall. 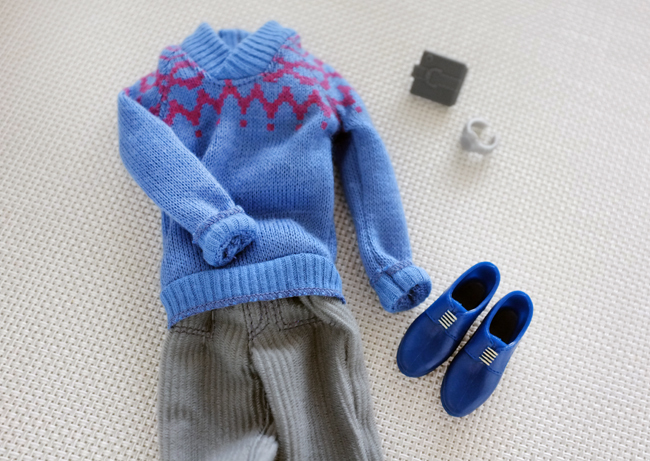 i love his sweater :) great post! Macarons and fried chicken, some of my favorite things! 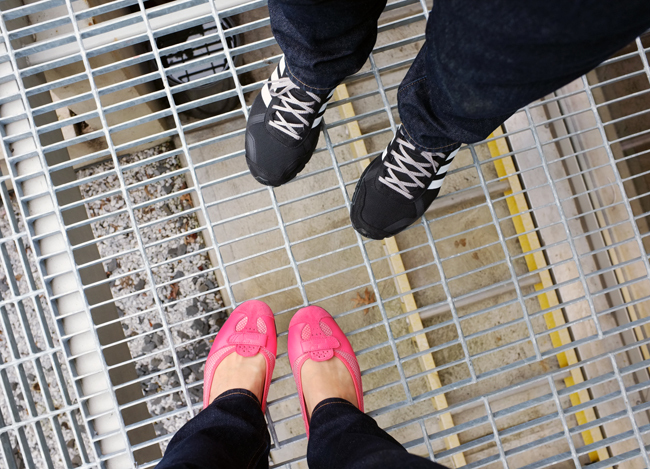 I like your pink comfy shoes, perfect for running around in the big city! Beautiful photos as always Rowena. 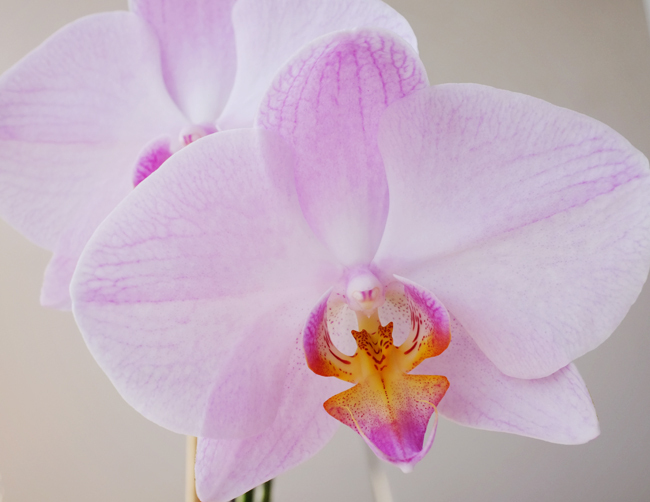 In your second photo of orchids, the flowers are beyond real. So pretty, your husband must be so proud and he should. I have never tried macarons up until now. So sad, the colors are so cute. Maybe one day when i can find anyone who makes and sells them. Loop I can't wait to see the new outfit on Ian, and what we'll see in miss Rena. I am so hungry right now so those macarons look so yummy! Yum, your food photography skiils keep getting better and better! can you believe i never walked on the brooklyn bridge? i try it before it gets too cold. and i'd love to try the fried chicken! i work 5 minutes from the place. why didn't i know??! Mmm macarons. Hopefully we can try a few new flavors then! I need new, comfy shoes! Gorgeous photos as always! :) Makes me wish I lived in NYC. The macarons and club sandwiches and fried chicken look soooo DELICIOUS. I haven't had fried chicken in months! Yum! I'm starving...why'd you have to do that to me??? Great pics! So many goodies here! Love the ring :) and the club sandwich looks delicious! I have a weakness for the macaroons!! What an amazing town... Great images!!! OMG those Laduree macrons= perfection!! I had the chance to try them for the first time in Dubai and they were amazing! that sandwich made me salivate! These photos are so nice. 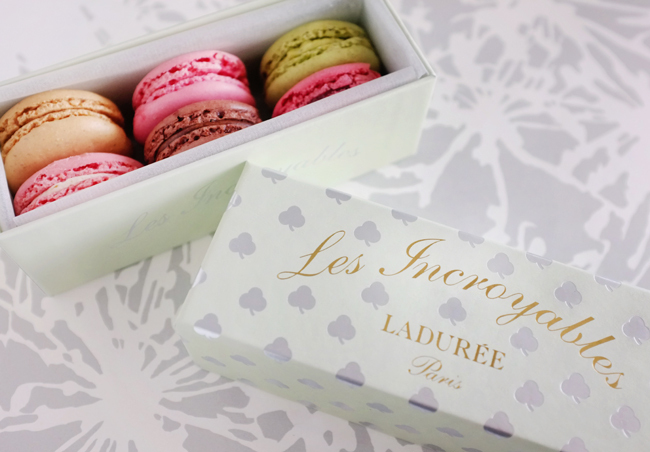 Those Laduree macrons are absolutely delicious. 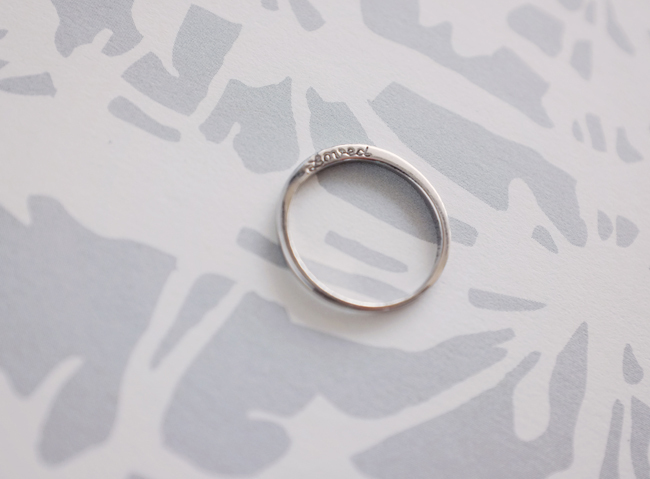 Love the ring too. Your pictures are amazing Rowena! Love the ring you got and the food--seriously making me hungry! Hope you're having a great week! Wow! These photos are stunning! Like they're straight from a magazine. So beautiful! I love those silver clovers on the box! You know, I don't think I've ever had a macaron? Or if I did, I don't remember. That orchid is so pretty as well, it's nice you were able to get it to bloom again. Yeah, I can imagine the price for that fabric and what the price for the pants would then be. Even with the discount, the prices there regularly make me cringe. I would be interested to see the line though. I hope that you posting more often is a good sign that you're feeling better! I have to say you certainly have a Knacfor making photos look beautiful! Drooling over all that food! I love your blog. insta-follow! great photography and looks like you've been having lots of fun lately! Love the pink shoes! Oh, how I wish I lived in NYC. I bet you have a never ending source of things to take pictures of. I just got off this macaroon frenzy recently, and that box is luring me back in. What flavor is that green one? Oh how fun, love your shoes. The Missoni replica is amaizng! Wishing you a lovely rest of the week. LOVE these photos! The pic of the orchid is just gorgeous, love your new ring, and those shoes are super cute and fun! Hope you have a fabulous weekend! ADORE this post!! food, fashion and jewelry my top 3 favorite things!!! that outfit for ian is adorable!! and i loveee your new ring!! drooling over that club sammie and that fried chicken! This looks like a lovely few days, great pics!! I love these little bits from your life! Such cute pink flats and I wish I could steal a macaroon! Its been so nice stumbling upon your blog. Maybe we could follow each other? Wow, I really shouldn't be looking at these pictures of all that deliciousness... I have not had breakfast (I know, so bad!) and it's no where near lunch time yet (sniffles) The food looks so good right about now. Oh, and all the other pictures were just as lovely, I especially love the outfit for Ian; super cute!